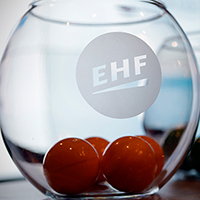 All six teams for the EHF Cup quarter-finals have been confirmed after the conclusion of the group phase. Three quarter-final pairings will be defined by the draw which will take place on Tuesday, 1 April 2014 at 12.15 hrs at the Gartenhotel Altmannsdorf 2 in Vienna. In the Pot 1 there will be winners of Group A (Lugi HF), Group B (Montpellier Agglomeration HB) and Group C (Pick Szeged) and in the Pot 2 the three best second ranked teams (Sportin CP, HBC Nantes and HCM Constanta). Two teams from the same group cannot face each other in the quarter-finals, but there will be no protection from teams from the same country. The first leg matches will be played over 19/20 April on courts of the Pot 2 teams, the second leg is scheduled for 26/27 April on courts of the Pot 1 teams. Füchse Berlin have clinched a direct ticket to the EHF Cup Finals as the hosts of the final tournament won the Group D.
The handball fans will be able to follow both draws live on various channels. There will be a live streaming of the event on ehfTV with a commentary of Tom O Brannagain, who will also interview all club managers right after the draw. In addition, there will be a live ticker on www.eurohandball.com available and also a live coverage on the official Twitter channel - @ehfmedia.